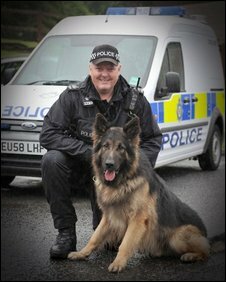 Pc Chris Swallow was helping a friend with their garden in Helensburgh, Argyll, when he spotted the black creature on a nearby railway line. The officer, who is stationed at the Faslane naval base on the Clyde, said the cat was as big as a Labrador dog. Big cats have been reported in the area in the past, with several sightings of the so-called Coulport Cougar. Pc Swallow said he saw the animal on 30 June while working in the garden at Kildonan Drive, Helensburgh. He could tell it was not a Labrador, as he first thought, because of the way it was walking, and because its tail was about twice the length that a dog's would have been. He said: "My friend's house is next to the West Highland Line and at one point I looked down and saw what I first thought was a black Labrador on the tracks. "There were trains coming and going throughout the day and I was a bit concerned, but when I looked again I saw that the animal wasn't moving the way I expected a dog to. "It was then I realised that what I was seeing was a big cat and I shouted on my friend to come and have a look. We were stunned." 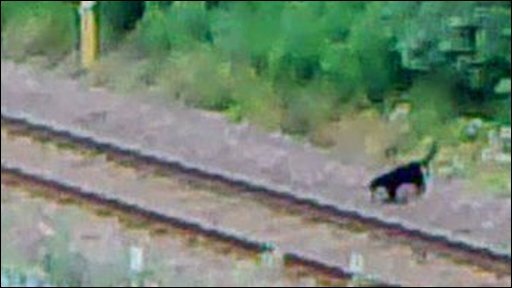 After running to his car to grab his camera phone, Pc Swallow stood on the rail bridge at Winston Road and got a still photo and a couple of minutes of footage of the animal moving up the railway line. He added: "It was remarkable. I've heard stories about creatures like this moving about the countryside, but never really believed them before. Looking back at the video I don't think there's any doubt that it's a big cat." The Coulport Cougar was first reported in June 2004. The creature was described as being tan and prowling the woods and hills around Loch Long, Portincaple, Whistlefield and next to the Coulport access road. However, another creature, described as being black in colour, was also spotted at the nearby Garelochhead Training Camp, leading some people to believe that there may also have been a panther in the area. John Belshaw, pest control officer at the Faslane naval base, said he had spoken to people in the past who had been "quite shaken" by seeing a big cat cross the road in front of them during the night. Mr Belshaw said: "I have had a look at Chris's footage and have to say that I do not believe it is a domestic cat or a dog. "At one point in the video it seems to walk on the railway line and a dog simply wouldn't have had the balance to do this. "Also, you can tell from the size of the track that it is much larger than a house cat." There have been regular reports of big cat sightings across the UK, leading to speculation that they may have escaped from a private zoo or collection. Shaun Stevens, a researcher with the Big Cats in Britain group, said: "We have regular sightings reported every year of large black cats in the Helensburgh area and it appears to be a favourite haunt of these animals. "In Argyll, I probably get to hear of maybe 20 or 30 sightings in a year. In the UK we get a sighting practically every day." Mr Stevens said he believed the cats could be a hybrid species, or possible an entirely new species. "I myself have photographed a black hybrid cat of over 3.5ft in length," he said. "Knowing the width of the rail tracks in Chris's video is 4ft 8.5in, the animal photographed by him is clearly in excess of 4ft and as such is certainly not a domestic cat.